A Sunflower Tam --with Petals! Miss B, the beloved grandchild, got “an American Doll Girl” (as she says) for Christmas. My DIL, who I love and adore, knits and does all sorts of clever things—but I've noticed.. We work to different scales.. Her art work is HUGE. I tend to the minitures. I suspect she'll make some doll clothes, but such tiny work is not her normal mode. So, a small amount of sock yarn (superwash, of course) and a few hours, (and a complete and total frogging of the first effort!) and here is Miss Samantha's first sweater. (Ok, it still needs buttons—but they are coming.) The T pins are marking the button hole positions. blocked into a nice shape (the button bands tended, as button bands do on stocking knit, to curl) --Oh my what a sweater! Next up a hat and muff set.. Not exactly matching (how trite!) but the green hat will be worked with stripes of yellow and orange—so coordinating. there might even be a dress made to go along with the sweater set. In addition to writing, I read blogs. Some are knitting blogs, some are nominally knitting blogs that only touch on knitting infrequently, and some have nothing to do with knitting. Each one, has features I admire. Wordless Wednesday, or 9th of month, or Tuesday is for spinning.. I am going to try to have some regular features—one is 'the First of Month Freebe' –with a free pattern, and link to another free pattern. And at least once a month, a recipe (one of my own, or a link to a special one). And I definitely want to make some more tutorials.. and some You Tubes tutorials—on my favorites techniques. And working on organization, making it easier to find information, links, free patterns, recipes, all sorts of stuff is a chore I've avoided. Its time to set up an organization to the blog, to make it more user friendly. Some have so many comments! I am, to some degree envious of this.. but.. I don't think this generating more comments is one of my goals.. (readership, yes, but comments no.) Readership is a comment! *More about my wonderful swap partners, and my roving, later in the week. *Nota Bene: this post is half the length of previous one! I had for a while, been thinking about a 'woodland elf' type hat. Something like an acorn cap --a stem, a network of overlapping 'leaves', like found on an acorn cap--knit in a shape that was slightly domed, (but only slightly!) and ended in a curved under edge. Then the 'body' of the hat, like the body of an acorn, would be smooth (and almost straight). 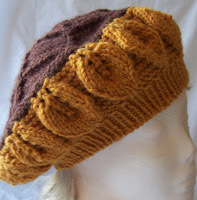 When I got Knitting Nature, (Norah Gaughan) I loved the Sunflower Tam, and started again with a cable/twist stitch design, (again starting from center out) and again, failure! 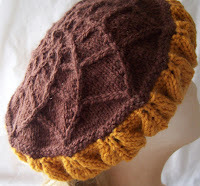 So, finally decided to make the sunflower tam, and learn how it 'moved' before trying again with my center out design. But--I didn't much like the under brim of the hat.. The top was beautiful, but the under brim? Boring! And that the part most people see (OK, basketball player are going to enjoy looking down on the top of the hat) but when looked at (face forward) the sunflower tam is well, ho hum. Why not add petals? Petals on the brim would bring the Sunflower motif to the under brim! And so I went to work modifying the pattern. No increases or decreases, until the final row of the petal (where the original 3 stitches of each leaf become a single stitch via a double decrease--(16X 2=32 stitch decrease) leaving me with 96 stitches. This is a few stitches short of the original patterns 100 stitch cast on—but still not too tight. Start with 8 stitches, and increase 8 times EOR. Unless a YO is used for the increase, the knitting (in stocking knit) won't quite be flat. Start with a multiple of 8, (64 stitches, for example) and decrease 8 stitches EOR, in stocking knit—it still won't be flat. In fact, it will create the classic dome of a beanie hat! The Sunflower Tam uses twisted stitches and decreases, (8 decreases EOR) and the twists, change the gauge just enough to make the knitting flat! I am keeping the top of the pattern as written, but I started with a provisional cast on, and worked the crown. 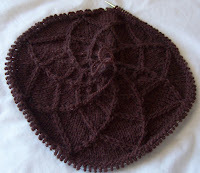 (as shown) Next I undid the cast on, picked up the stitches, and now I am going to work the brim--with some changes. The hat will be finished by the next blog entry, I am sure. I blog for a number of reasons, --I love knitting, and I love sharing information about knitting -be it about what I am knitting or what others have done to inspire me--or annoy me! To be honest, I some times knit spitefully—when someone says “these are all the ways to do this”(and shows 5 or 6 ways) I am likely to take it as a challenge, and do it some other way! Sometimes I repress that spiteful urge.. but not always. On the other end of the spectrum, I also am somewhat of a braggart, and blogging is made for bragging! I also blog because I am vain. I blog because I have always thought of myself as a writer. I did, once (going on 25 years ago now!) have an article I wrote for a magazine, republished (with my permission.) The article was in a syndicated by KINGS features column--so (potentially!) hundreds of thousands might have read something I have written. (It was about shopping; in a former life, I was a coupon queen.) The column is no longer published. Going further into the past, (30+years) I had one or two articles in The Long Island Press—defunct many years now (the DAILY Long Island Press, not the free weekly with the same name) –but all of this is a very small body of work! I blog and write as a way of shaping my life. I think this is a nice side effect of writing..The choices I make about subject matter, the view I present, the focus, (the lessons I've learned)--all of this is for me to chose. I could chose to have a “half glass full” view (something I did for many years!) or to be a Polyanna, and see only the good. (a view nearly as bad as the opposite, I now think)--I know I have it in me to be mean and spiteful—but I try to keep this in check, and to aim for the “positive re-frame”. Are you familiar with the idea of positive re-frame? Its a way of taking the facts (are the facts the truth? Sometimes) and seeing all of the facts. Movies (some movies) do this superbly.. One is Mel Brooks version of 'Robin Hood'. green fields, with grain, and cattle, and farms and men working in the fields, and all sorts of animals. Everything is idealized, everything is beautiful, everything is good. There are holes worn in the carpet. Every detail is dull, dirty or broken. Each character see something different.. in each case, there is a level of truth—but neither is seeing the whole. things (material good) than I could dream of as child. I can (and try to!) focus on the good, the positive—but I don't deny the bad. It's there. It has shaped me. There are facts, and somewhere there is the truth. I am still looking for it! And blogging, I find helps! On Sunday, these socks were less than a dozen row/rounds from being complete. But I didn't finish them till late yesterday afternoon --and the real finishing, (weaving in all the ends) didn't get completed till early evening. They are not every day socks.. they are thick and cushiony, --and a bit hard to put on and take off. Worked at 9 stitches to the inch, and stranded, they are snug socks (the foot was worked over 68 stitches, the leg over 78). They are the perfect socks for horrid days.. you know the ones.. when there is rain or snow or sleet predicted (or, as happens, all three!) and circumstances dictate being out and about all day. NYC has one of two of these each year, and sometime, I have plans that I can't, or don't want to change. I can think of 2 that occurred in the past few years. One was New Year's day 2001—Memorable for the cold, cold weather, and the MOUNTAIN of snow (about 2 feet!). A friend, and her family were visiting, (from the UK). and we had planned a full day of sight seeing. Including a walk across the Brooklyn Bridge. We ended the day (of sightseeing) atop the WTC.he real end was back uptown, at their hotel, for dinner and alcohol.. (lots of alcohol!) which was fine, because I had taken public transportation to Manhattan (and did the same going home) and tipsy doesn't matter on trains! It's days like these that demand soft, plush, warm socks! And there are one or two every year. Do you know what a sugar plum is? Actually the nearest modern equivalent would be “a sweet treat”--the term was used for a variety of treats, from small hard sugar candies, to 'sweetmeats'-- treats made from fruit or nuts. One of my favorite 'sugar plums' are stuffed dates. Take ready made marzipan, cut into small chunks, and roll into small 'logs'. Stuff these, as is, into pitted sweet dates. or something similar before stuffing into the dates. These are slightly more nutritious than candy or cookies—after all they are fruits and nuts and they are yummy! Roll the bacon wrapped dates in brown sugar. Broil 8 to 10 minutes, (turning once) till bacon is crisp. They shouldn't be eaten right out the oven, (they are too hot) but adults will ignore all suggestions to wait till they cool down! Warning: no matter how many you make, it won't be enough--of either! 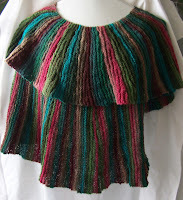 Not yet seen, but half done, is a second Ruffles scarf (see Scarf Style, Pam Allan/designed by Amanda Brown). The first 2 balls yielded about 40 inches of scarf, I expect the next 2 balls will bring the finished scarf to about 80 inches.. a nice length. The scarf is endless.. (all those short rows!) but its does look very pretty in the two tones of green). Secondly, I have been working on my 'free socks'. The bulk of the yarn for these socks is left over from other pairs, Plus one odd ball (in a totally different dye lot)- that I space dyed with easter egg colors. Remember theses? (from Oct 27th?) They are more like socks now! The colors are pretty, but there isn't enough contrast for the fair isle type patterns to really jump out –so, it was almost inevitable, that errors would creep in.. and boredom, too. So, the errors were left, and to resolve boredom, the patterns were changed. The ocean waves gave way to a rippled shore design, and then to flights of fancy. I am almost out of yarn, and the socks are almost finished. They are pretty enough.. not perfect, but then, they are just everyday socks.. albeit extra warm ones! The fabric is a nice dense 9.5 stitches to the inch, (I increased after the heel so that the leg of the socks would fit on to my fat (full sized!) ankles and would be easier to put on). The close colors make the designs elements subtle--besides they are just socks, and usually only seen from 5 (or more!) feet away. I really hate knitting scarves and shawls. No matter how enjoyable they are at the beginning, at the end, they are all tedious. Especially when the style is one that has increases, row after row, and the further along you are, the more stitches there are in a single row—add short rows to the pattern, and row after row of knitting results in what seems to be very little progress! That said, (I am still plodding along on a second version of Amanda Brown's Ripple scarf—long and short rows both!) I am please to announce that the Noro Swirl shawl is done. Here is one image, (later this week I'll spread it out into the spiral.. (no where near 540°, but more than 360°) so you can see the shape. It could have been bigger.. but as the end of the skein (and yes, the shawl was knit with 1 skein!) became evident, it was evident to me, I was at my end, too! I haven't seen the shrug pattern I like yet.. so if a shrug, it will have to be designed! 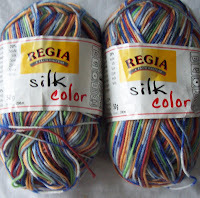 * I told Sonya I want this yarn, --but I also offered her the 2 skeins of grey. 1 skein is so limiting, 3 opens up so many possibilities! 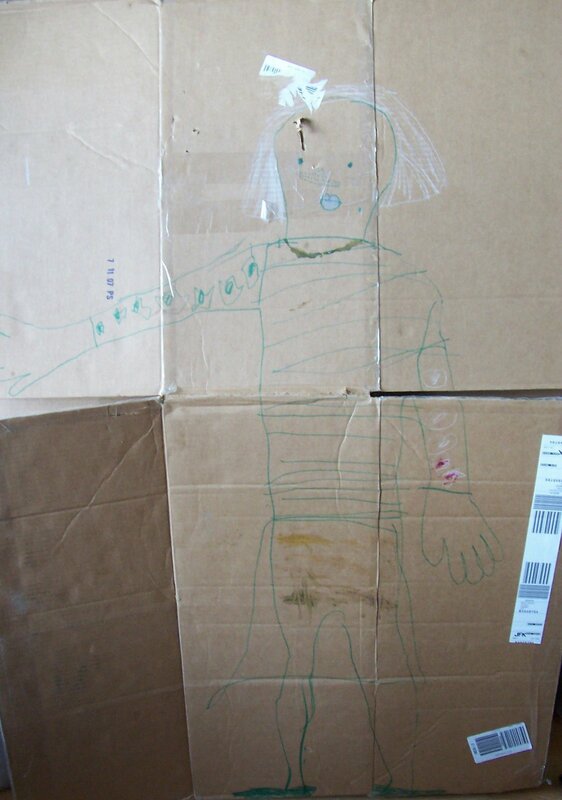 <--This is Miss B.. on a box! This post is not about madelaines, but spareribs.. It was part of a wonderful feast of food that included home made tortilla's, fresh roasted pepitas (ie, pumpkin/squash seeds)--as a garnish for the homemade pumpkin soup, heirloom tomato salad, and black beans, and salsa. All reflective of DIL and son's philosophy about the use of fresh, local foods. It was an impressive amount of cooking (and I ate a bit of everything!) and all of it was good--and much of it was spicy, hot and flavorful. I love spicy/flavorful foods--they are a real change from most of the foods I at as a child. I love onions, she hated them! I love nuts (and seeds) and she hated them. She loves french cut green beans. They make me gag. The list goes on.. and only rarely is there a food that we both liked. It was not a match made in heaven. My mother was a picky eater, too, (she is a bit less so now, but I suspect she still is reluctant to try new foods) I am less reluctant than I was as child to try new foods, but I am hardly an adventurous eater--and of the many of the new foods I do try, there are still ones don't like--(well I don't like enough to make for myself.). But I love spicy food. For most of my childhood, the basic (and often only seasoning) used were salt and pepper. One very strong memory, though, is of spicy hot bar-b-q spare ribs. I don't know who convinced my mother to first try bar-b-q ribs. I only know she did. convinced her, and low and behold, She loved them. Well it was off look for a recipe... I am pretty sure, the original recipe came from Redbook magazine. My mother subscribed to Redbook, and no other womans magazine. She didn't always buy Woman's Day or Family Circle—these and others womans magazine I learn to read at relatives—and she owned, as best I can recall, only 1 cook book. The recipe, perhaps from an article labeled “bar-b-q-ing with out a grill” featured what is now called “Carolinian” style bar-b-q .. The meat is slowly braised (boiled/steamed) in a spiced, lightly sweetened vinegar, then it is removed, let cool, while the sauce is reduced, and de-fatted. Then the meat is reheated under a broiler--it only needs to be reheatd, because it has been completely cooked in the vinegar and spice mix. While reheating, it is glazed with the 'reduced sauce'. Because it is fully cooked, it only needs to be lightly broiled, the meat doesn't dry out and glaze doesn't burn either, but just lightly caramelizes. The braised meat is seasoned through out. The glaze just adds another layer of flavor. The recipe she found has a huge list of, what where to her, and us, exotic spices—Most were fairly common every day items in most kitchens, but not in ours.. Items like: garlic powder, cayenne, chili powder, as well as other exotic things like molasses, and corn syrup. Even apple cider vinegar was a new and different change from the standard white vinegar that was our household staple. Each was purchased specifically for the ribs. Each was measured out.. the recipe was followed to the T—an other exceptional activity, since cooking with these spices was a totally new experience for my mother. The meat—racks and racks of meaty spareribs (my dad was a butcher, and we never lacked for meat in my childhood) - were cooked covered, in a slow oven (about 250° F) for hours, then the sauce was poured off, chilled, de-fatted, and reheated, and reduced. As dinner time approached, the house began to smell wonderful! Under the stove broiler, the glazed meat got dark and crisp, it looked and smelled better than anything my mother had cooked before. Everyone was looking forward to the dinner. They were hotter than hellfire—especially to our palates-- so unaccustomed to spice food--but--and this is the best part--We devoured them. The recipe was an absolute failure-- and a resounding success. Even my mother ate them. There were, in spite of our complaints about them being 'too hot', none left over. The bones of every rack were picked bare, the plates were wiped clean. We sat back in our chairs at the end of them meal complaining about our seared tongues.. after having all but licked any remaining sauce of our plates! We were bloated with food and fluid, and finally my mother spoke up. NEXT TIME, she said, the next time, I am just going to use ¼ of the amount of spices called for! And there was a next time, and with all the spice reduced, the ribs were flavorful, still a bit hot, but much milder. Bar-b-q-ed ribs became one of my mothers signature dishes.. Everyone raved about them. Any time she made them, for parties or family get together's, they disappeared in seconds. Everyone raved about my mothers recipe for ribs! Those ribs were my first taste of hot spicy food.. and they created for me, a favorable associations.. for ever after, I felt confident saying.. “I like spicy food” and I went on from there to enjoy chili, and Indian foods, and Mexican foods, and all sort of other spice cuisines. My palette is still tuned to milder (less heat) chilies and spices than hot ones--but good spicy food is flavorful, not just hot. And it is still a favorite!